Improve the appearance of your tresses with HAIRFINITY Healthy Hair Vitamins, an advanced haircare, dietary supplement that delivers essential nutrients and minerals to promote healthy hair. 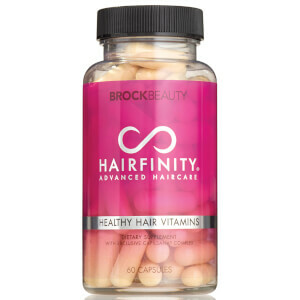 Working from the inside out, the revolutionary formula fills gaps left by your regular diet to nourish the scalp and follicles, and set the foundation for maximum hair health. It utilises Vitamins A and D for antioxidant protection, and an exclusive Capilsana® Complex with amino acids to build strength supported by biotin which stimulates keratin production to promote growth in existing hair. Suitable for all hair types and textures, you can expect luxurious locks with improved resilience, glossiness and vitality.